"The Dragon line includes the Sr1 DSR, with 3 National championships in Solo [as of May 26, 2005], ... and the newest entry, the Sr2 for DSR and CSR Club Racing/Solo. 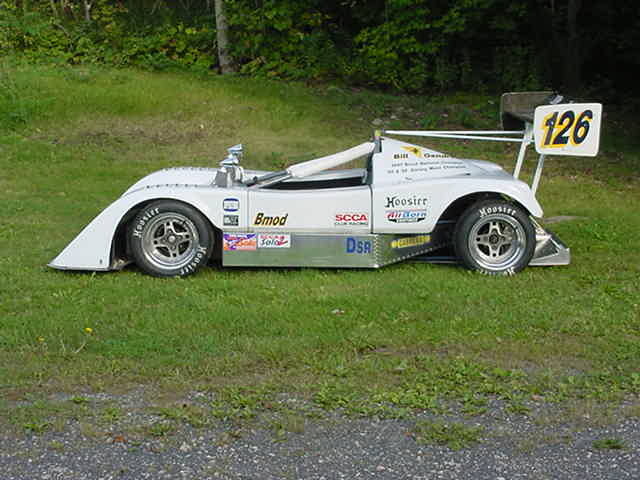 Bill Gendron, 1997 Solo II B-Modified National Champion, of Small Fortune Racing Enterprises changed his LeGrand MK25 D Sports Racer over the last 10-12 years to the point that he finally renamed it a Dragon SR1. 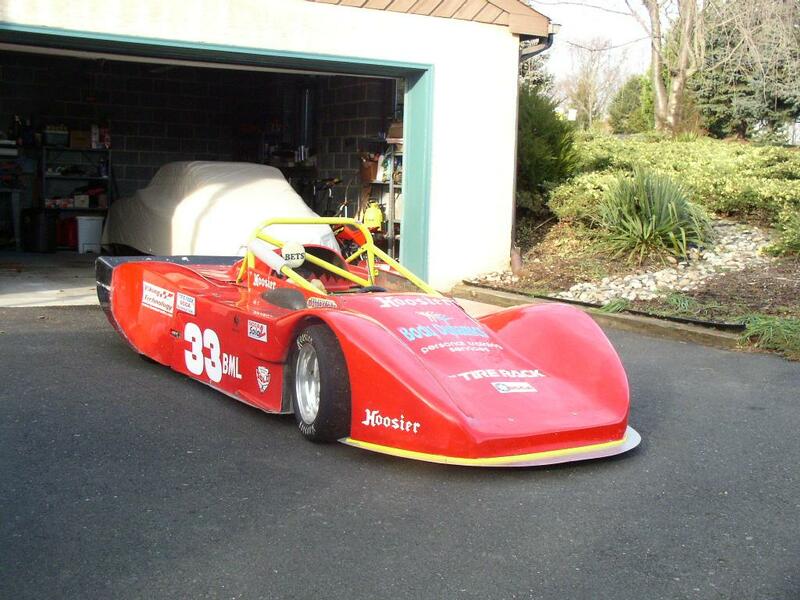 Bill says, "I have a lot of experience with LegGrands (going back to 1984) and while I did start with a LeGrand Mk25 plan, the car was raced and solo'ed from 1986 to date and now bears little resemblence to a Legrand underneath. Just a different tub, front suspension [lengthened the front A arms], rear suspension and drivetrain." 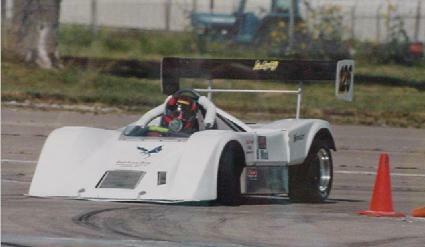 The car has won SCCA Solo II Nationals in B Mod 3 or 4 times, with a Kawasaki motorcycle engine. Bill also built a second chassis in 2000 for Vern Lyle and plopped his 2 stroke engine into it. Vern did the rest. There have only been two cars made. The information below was provided by Vern Lyle. The WAS for sale "for the much reduced price of $12K, or $7K as a roller." This particular car is basically a copy of a LeGrand Mk18 D Sports Racer which was built from scratch, finished in May 2000. The car weighed 1020# with driver on a 980# rule at the 2004 Nationals and has about 20# of ballast. It could easily make the 980 limit but we have found scales at large events to vary a lot. Specifically built for autocross, it has a 4.5 gal fuel cell, an 80� wheelbase, and the fire system is not installed, otherwise it is legal for DSR. It has an aluminum monocoque with square-tube rear subframe, original LeGrand magnesium uprights on all corners, Wilwood calipers (larger single on rear), brake bias bar, 8 and 9.5 inch. Keiser wheels. 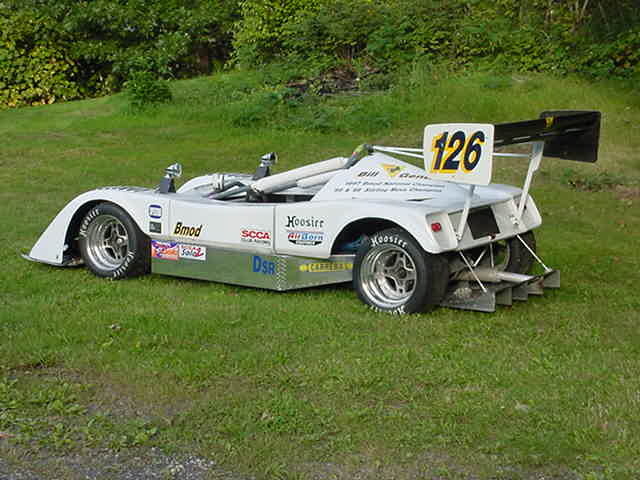 The body is a Sorcerer made of fiberglass by Paul Shinsky in Texas for road racing Mk25 (essentially a copy of a Lola CanAm car). Turns out road racers use a much wider rear track, so this body was narrowed 3 inches per side, tapered back from the front fenders. There is still room to add probably 2� per side of wider tire. My aero guy added a big scoop in front to compress air under flat bottom of car, dive planes, and a carbon-fiber diffuser in the rear. He says that this package will produce several hundred pounds of downforce at 50 MPH. I did have to stiffen the springs and shocks to keep from scraping the ground. I have had no real test time to sort out handling with diffuser attached, so we filled in the front scoop for a more traditional look with a splitter. Mechanical grip is excellent and predictable now, so adding the diffuser and re-opening the front would increase the overall grip and handling, but require a bit of sorting to re-balance it all again to take advantage of the ground effects. We don�t have the luxury to do that, so lots of improvement is available. Springs are currently pretty soft, chosen for the bumpy Topeka, Kansas autocross course. Carrera shocks were re-valved two steps stiffer than what Gendron originally ordered. Gendron built the chassis with his modifications, attached the suspension with his modifications and plopped our engine into place � we did or had the rest done. Over the first season and a half we broke a few brackets and had to stiffen up the secondary clutch mount, and this limited our seat and development time. However, I am certain that all the weak points have been found and corrected. If the car was going to break, the two concrete courses in Topeka have been the best test. Two drivers ran 18 runs over three days in 2000, 12 runs in 2001, 12 in 2002, and 18 in 2004. We got dirt in the throttle slides in 2003, so the performance was off. First time we ever had carburetor problems! In 2004, after the first day, my wife Betsi was leading the perennial class champion by 0.7 second, and I was 0.7 second out of the lead in the open class. Unfortunately, on the second day I found out on the long straight that the car was geared too low. Actually, it turned out to be too much spring pressure in the secondary clutch but I didn�t figure that out at the time (easily changed in 10 minutes). But what happens is that in a 2-stroke the revs keep climbing but the power drops dramatically. Betsi dropped to 2nd and I dropped to 5th. We learned something the hard way as we never saw or tested on a straight that long. Obviously, we've changed the spring pressure since then. The car has a 4.5-gal ATL cell, Interrupter pump, and Holley regulator, electric key start, voltage regulator, and gel cell battery. Using the two fans on the VW radiator in 90 degree heat at Topeka, water temp after a run was 145 degrees. So, it has cooling to spare. Clutches are Skidoo, with a great setup for autocross (coming off slow corners quickly). It has a rear differential with torque-sensing Quaife which is chain driven over standard type motorcycle sprockets. Sway Away axles and VW CV joints. I�ve got the clutches (collectively called the Continuously Variable Transmission) pretty close. The first time I ran Nationals, it was raining and I was 3rd out of 26 cars after the first day, I beat Gendron by 0.4 seccond on the faster south course, and finished 5th. The car has an awful lot of potential, indeed, it could bring A Mod ground effects technology to B Mod. The car is certainly capable of winning FTD (Fasted Time of Day) at any regional autocross event anywhere, and win on a Divisional level. In the right hands, this car could win B Modified at Topeka. In fact, at the 2001 Nationals, Betsi won B Mod Ladies against a 5-time National Champ. I was 1 second off, due to not having enough seat time with an improved clutch setup. In 2002, the carb problems kept me from doing well, but after cleaning them, Betsi ran a faster time then I did (I�m usually 2-3 seconds faster than her). At $12K, the car is priced at probably one quarter of what we have in it, and includes many parts and spares. Price is a little flexible, as is the cost of the new spare engine, and for a small consideration could include delivery right to your door. After the body had extensive revisions - shortening for the 80 inch wheelbase, narrowing a tapered 3 inches from the front of the �doors� to the rear for a closer tire fit - the body was painted with Porsche red. I want to be totally upfront with you - there are several nicks, tears and �dents� (easily repaired in glass but would require touchup paint), but from 15 feet away the body looks great. The carbon fiber bulge on the right side is for a driver�s flailing elbow. 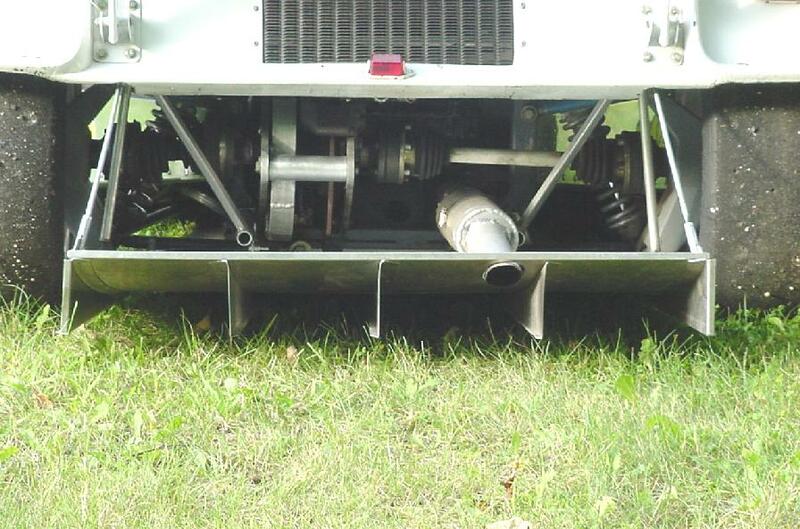 An aluminum VW radiator with two electric fans and a very effective shroud are mounted on a swing-up aluminum plate over the engine. Hoses were cleverly located to allow this movement for access to plugs, carbs, and pipes. The fans pull air through the body scoop and blow down on the engine. I was real worried about this at first, but it has not been a problem. The Crank Shop says, "with snowmobile motors it�s as simple as fire it up and it�s ready to run" � and they�re talking about in the middle of winter. We let it warm up 'til the temp needle starts to move, try not to idle too long, and never saw over 160 degrees at an autocross. Behind the engine air scoop is a clever intake that pulls cold air into a big plenum, and feeds it down to each individual carb. An extra set of Keiser wheels (8 and 9.5�) with treaded Hoosier Dirt Stockers (205/60x13) for use in rain or cooler weather - used only for 2 runs in drying conditions. These are VERY soft and should not be run in the dry. 2 more Keisers with spare front and rear slicks. R25 slicks on the car were run only at Topeka and not since. On the surfaces we run, a set usually lasts for about 75-80 runs before the rubber starts to go away. - extra front gears for mounting on jackshaft (10 and 11 tooth) and new rear sprocket (40 tooth). We used a 50 rear and 10 front for a 5:1 rear ratio. This has been changed to get around 4.2. This is one of the �mysteries� of the Continuously Variable Transmission: one snowmobile national champ said definitely keep the 5:1, another said the 4.2 would actually accelerate better - but they were talking about how the variable clutch system would compensate for the different gearing. We currently are using a 10/42 � it works well, but some experimentation could improve it for your use on different surfaces. One of the beauties of the CVT is that there are a lot of different combinations that do work. There is no one �hot setup�. - 3.5# Halon fire bottle system, in case you want to road race. Except for this not being installed, and rear view mirrors, the car is legal and ready for DSR. That�s all I can think of. If you have more questions let me know. 1Information and photos from Small Fortune Racing Enterprises web site.